The singer scored nominations for Best R&B/Soul Female Artist, Album/Mixtape of the Year for A Seat at the Table, Video of the Year and Song of the Year for Cranes in the Sky, and Best Dance Performance and Best Collaboration for Don't Touch My Hair, with Sampha. She is followed closely by Bruno Mars, who has six nominations, including Best R&B/Soul Male Artist, Video of the Year, Best Dance Performance and Album/ Mixtape of the Year for 24K Magic, and Song of the Year for That's What I Like. Solange and Bruno will compete against Mary J. Blige's Strength of a Woman, The Weeknd's Starboy and SZA's Ctrl for Album/ Mixtape of the Year, and Childish Gambino's Redbone, Khalid's Location and Wild Thoughts by DJ Khaled, Rihanna, and Bryson Tiller for Song of the Year. 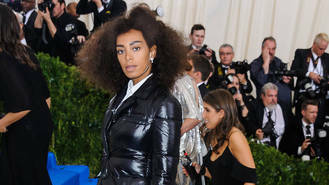 Solange will also go up against her sister Beyonce for the Video of the Year category. Beyonce lands a nomination for All Night alongside Wild Thoughts and Party by Chris Brown, Usher and Gucci Mane. Other nominees for the Best R&B/Soul Female Artist category including Kehlani, Lalah Hathaway, Ledisi, Mary J. Blige and SZA, while the remaining nominees for the male equivalent including Bryson Tiller, Chris Brown, Khalid and The Weeknd. Toni Braxton is set to receive the coveted Don Cornelius Legend Award, while R&B trio SWV will be honoured with the Lady of Soul Award in recognition of "their long-standing presence in the music industry and influence on the world of soul and R&B music past and present." The BET Presents: 2017 Soul Train Awards will take place on 5 November at the Orleans Arena in Las Vegas, and the show will be broadcast on 26 November.